Geopolitical: The multipolar relations between ever bigger political entities with overlapping spheres of influences are defined by surpise and uncertainty. Smaller political entities will be weaker and proxy wars more common in the future. Detterence will be reinterpreted, vulnerable states more prone to aquire nuclear weapons and international norms weakened. Megacities will be central battlefields that leave ground forces vulnerable. Social: Warfare will shift to the internet, it will be uncontrollably ‘open-source’, live and shocking, with ever more spectacular terror. 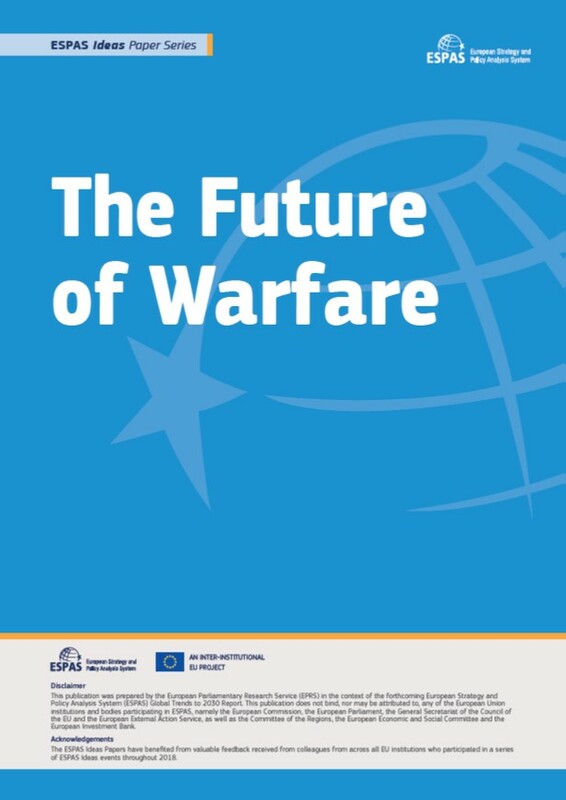 Armies will be more network-centred, waging more personalised wars and will have to find new ways to interact with democratic societies. Women in combat and the disappearance of world war veterans change the way people think about war. Technological: Mankind becomes more powerful over time, with non-state actors possessing capabilities currently restricted to super-powers. It will struggle to outlaw technological advances and wage war without violence. The West will lose its technological superiority and will have even bigger problems in knowing how and what to research. Both inferior and highly developed armies will develop new ways of engaging the enemy. Artificial intelligence (AI) will mean that democratic armies have to balance the ‘human in the loop’ policy against effectiveness. Economic: The economy of the opponent will be a bigger target than in the past, with commercial and dual-goods becoming more important, and the environment a more widely used weapon. Military: Possible future military situations will be more diverse then ever. Western armies will be vulnerable to cheap weaponry. The idea that wars will be easy to win will make the world more dangerous. Key uncertainties are China, the cyber-dimension, robotics, autonomous systems and artificial intelligence, paradigmatic breakthroughs such as quantum computing, general AI and anti-ballistic systems, nuclear detterence and nuclear bargaining. Ten key questions for policy-makers focus on strategic autonomy, adaptation, balancing reserves, R&D, cooperation and export, interventions, China, weakening norms, anticipation, communication and procurement.